Dave Bentley was born to be a rock star. When Dave forms his new band, Thor, there are plenty of sleepless nights for Janice, his on-off girlfriend and mother of his son. Not only must she deal with the thrills and spills of life as a hardworking single mum, but also the imminent return of singer-songwriter Ariel Swan, Dave’s one true love. Poor Janice. Dave is still the love of her life. Ariel Swan returns to small town life – and Dave’s heart. She and her friend Melodie (whose ambition is to be “a celebrity”) enter a TV talent competition, so Dave and the rest of Thor decide to make the most of the opportunity for possible fame and fortune, too. This adventure brings about big changes in the lives of all of them – none of which Dave could have anticipated. One member of Thor even ends up on The Jeremy Kyle Show..
Dream On is the third Terry Tyler book that I have read this year, so as you can probably guess, I am a huge fan of hers. I feel that Terry is extremely insightful into human nature and manages to encapsulate so many different characters perfectly while always maintaining her own distinct voice throughout her novels. From Dave Bentley, the wannabe rock star, to his long-suffering on again off again girlfriend and mother of his child Janice, to Ariel Swan, the singer-songwriter who returns to their small hometown after failing to make it in London, to Shane Cowley, the guitarist who is mostly just interested in picking up birds, each of the characters seem just like people you probably already know. None of the characters in Dream On are perfect and sometimes that aren’t even very likable, but I definitely felt myself empathising with all of them at some point during the novel. Even if you aren’t too interested in the rock scene, you will still enjoy the down to earth and refreshingly honest relationships in Dream On. I enjoyed Dream On so much that I have just added the sequel, Full Circle, to my reading list. I can’t wait to find out what happens next! I have been hanging out to read Last Child for what feels like forever and I definitely wasn’t disappointed! Last Child is the sequel to Terry Tyler’s modern twist on Henry VIII, Kings and Queens, which I also loved when I reviewed it earlier this year. Last Child takes up where Kings and Queens ended with the death of Tyler’s modern day Henry, Harry Lanchester and tells the stories of his children, Isabella (Mary,) Erin (Elizabeth) and Jasper (Edward.) Any Tudor buffs will know that the lives of Henry VIII’s children were very complicated but the author has put together a helpful brief history of the time period which really helps to put the characters from the novel straight with their historical counterparts. Last Child is written in similar manner to Kings and Queens with sections written by the main characters and several chapters written from Hannah Cleveley’s perspective to pull it all together. I really enjoy this style of writing, but what I particularly love about Terry Tyler’s writing is her ability to give each character their own unique voice and personality. I thought she did a particularly brilliant job at writing in the voice of a believable teenage boy! I was really drawn in by the plot of Last Child. I loved the romance, drama, humour, characters, plot and brilliant writing and found myself wishing for more at the end. It could easily be read as a stand alone novel but I think it is best suited to be read after Kings and Queens. Thank you Terry for such an enjoyable read! It was a spring evening in Washington DC; a chilly autumn morning in Melbourne; it was exactly 22.00 Greenwich Mean Time when a worm entered the computerised control systems of hundreds of Australian prisons and released the locks in many places of incarceration, some of which the hacker could not have known existed. Because Australian prison security was, in the year 2010, mostly designed and sold by American corporations the worm immediately infected 117 US federal correctional facilities, 1,700 prisons, and over 3,000 county jails. Wherever it went, it traveled underground, in darkness, like a bushfire burning in the roots of trees. Reaching its destinations it announced itself: THE CORPORATION IS UNDER OUR CONTROL. THE ANGEL DECLARES YOU FREE. Has a young Australian woman declared cyber war on the United States? Or was her Angel Worm intended only to open the prison doors of those unfortunates detained by Australia’s harsh immigration policies? Did America suffer collateral damage? Is she innocent? Can she be saved? Peter Carey’s masterful new novel, AMNESIA. 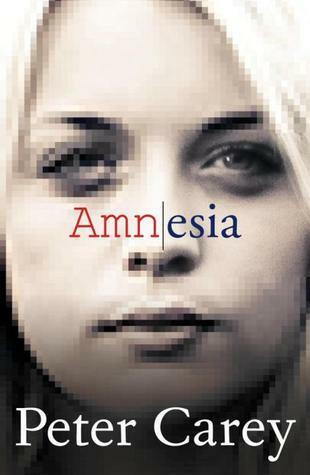 Amnesia by Peter Carey was not quite what I expected from the blurb, it was so much better. Rather than simply telling us the story of how an Australian hacker ‘Fallen Angel’/Gaby Baillieux hacked Australian prison systems to release detainees, Carey delves deep into Gaby’s and Australia’s political history to explain why a girl from Melbourne would decide to become a ‘hacktivist’ in the first place. The premise of the novel and inspiration for the name comes from the idea that America has at times been a bit of a bully towards Australia and Australians seem to just forget about it. Gaby is accused of infiltrating the Australian prison system to release immigrants who have been detained in Australia which also inadvertently affects many American systems. The American government sees this as an act of terror and immediately demands that Gaby is extradited to face terrorism charges there. Peter Carey says that he drew inspiration for Amnesia from the Julian Assange case when he discovered that Assange’s mother was a Labor supporter (lefty) in Australia during the 70’s and began pondering the implications that this might have had on his political motivations. Read the interview in The Australian here. Amnesia is told through the eyes of Felix Moore, a journalist and long time Labor supporter, who has recently been disgraced for falsifying stories. His career is effectively over and his marriage is on the rocks when he is offered the opportunity to write Gaby’s biography in an attempt to proclaim her innocence. Gaby is the child of an actress and a Labor minister. During her teen years she is exposed to some very radical Labor followers and falls in love with a hacker who teaches her all of his tricks. This combination means that she is almost destined to become a political activist. Carey discusses real historical events to describe the ongoing relationship between Australia and America, particularly the dismissal of the Whitlam Government in 1975 by the Governor General. The history books provide a number of factors that contributed to Whitlam’s dismissal, but in Amnesia, Carey claims that the CIA was behind it due to Whitlam attempting to take control of ASIO (Australia’s version of the CIA) and threatening to cease the agreement for the American army base at Pine Gap. I’m not too sure on my thoughts about Carey’s claims but I do agree that Whitlam was an extremely radical prime minister and I can easily imagine that his policies would have threatened a lot of politicians, so I can believe that many politicians at the time would have wanted him gone. Some of Whitlam’s notable achievements while he was in office include the termination of military conscription (another factor that would have gotten him offside with the American government I would imagine,) institution of universal healthcare and free university education. As a side note, I find it extremely hypocritical that the politicians who are currently campaigning so vigorously to increase Australian university fees didn’t pay a cent for their educations thanks to Whitlam. I wonder if they would be so determined if they were asked to pay for their fees retrospectively? I feel that Amnesia was published at a perfect time for me as I am currently studying a news and politics subject and it certainly gave me cause to ponder many issues from a different perspective. I also loved the many references to Melbourne suburbs and landmarks, although people from outside of Australia may find them a bit confusing or irrelevant. Amnesia was a thought provoking and extremely well written novel and I would recommend it to anyone interested in Australian history. Even if you are well versed on Australian history you will find yourself thinking about events in different ways and if you aren’t you will most likely be inspired to find out more as I was.